OneTaq® 2X Master Mix with Standard Buffer is an optimized blend of Taq and Deep VentR™ DNA Polymerases ideally suited to routine PCR applications from a variety of templates including pure DNA solutions, bacterial colonies, and cDNA products. The 3´→5´ exonuclease activity of Deep Vent DNA Polymerase increases the fidelity and robust amplification of Taq DNA Polymerase (1). The convenient master mix formulation contains dNTPs, MgCl2, buffer components and stabilizers, requiring only the addition of primers and DNA template for robust amplification. 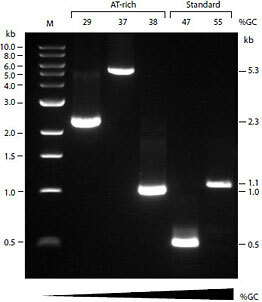 Amplification of a selection of sequences with varying GC content from human and C. elegans genomic DNA using OneTaq 2X Master Mix with Standard Buffer. Amplicon sizes are indicated next to gel, and GC content is indicated above gel. Marker M is the 1 kb DNA Ladder. OneTaq 2X Master Mix with Standard Buffer is stable for fifteen freeze-thaw cycles when stored at -20°C. OneTaq 2X Master Mix with Standard Buffer is also stable for one month at 4°C, so for frequent use, an aliquot may be kept at 4°C. Product specifications for individual components in the OneTaq 2X Master Mix with Standard Buffer are available separately. Barnes,W.M. (1994). Proc. Natl Acad. Sci. USA. 91, 2216-2220. Saiki,R.K. et al (1985). Science. 230, 1350-1354. Powell,L.M. et. al. (1987). Cell. 50, 831-840. Sun,y., Hegamyer, G. and Colburn,N. (1993). Biotechniques. 15, 372-374. Sarker, G., Kapelner, S. and Summer, S.S. (1990). Nuclear Acids Res.. 18, 7465. Use OneTaq 2X Master Mix with Standard Buffer to amplify routine targets with up to 65% GC content. Purchase of this product provides the purchaser with a non-exclusive license for research use only. NEW ENGLAND BIOLABS®, ONETAQ® , QUICK-LOAD® and THERMOPOL® are registered trademarks of New England Biolabs, Inc.